USgeocoder is a customizable Geographic Information System (GIS) web application designed to serve political campaigns, lobbying and advocacy, government, sales tax compliance, and marketing. USgeocoder geocodes each address, identifies its latitude and longitude, matches it to USPS and US Census database, and produce district matching information such as congressional and legislative district data products with contact information for members of Congress and state legislatures, local districts such as county, municipality, school board, and census geographies such as census tracts, blocks, and block groups. USgeocoder's proprietary algorithms produce the highest accuracy for location of addresses in rural areas. 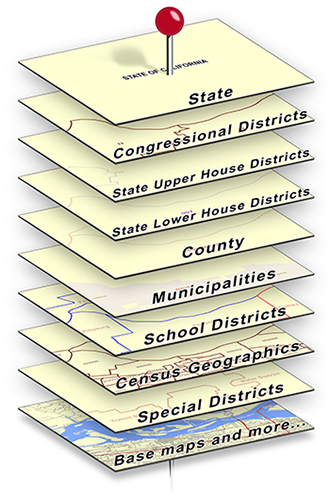 In 2014, USgeocoder was tested by a third party and found to be more accurate than either Google or Bing for matching addresses to the Secretary of States' assignment for each political and adminstrative body in the states, and to US Census for each US Census mapping component for demographic description (Census Blocks, Block Groups, and Census Tracts) of an address. As one of the very few OEM geocoders in the US, we own 100% of our software and hardware. We can produce any location related information you want. USgeocoder offers batch processing services for addresses with output standardized to postal and US government requirements. USgeocoder can match any address in the United States and its territories to every political entity that serves it and every US Census label that describes it. The USgeocoder API enables any computer direct access to this information. USgeocoder offers customizable interactive maps for any political or business purpose. USgeocoder updates its USPS data on a monthly basis and TIGER data within days of its release. No more frequent update schedule is available in today's market. So for the quickest integration of new addresses into your applications, use USgeocoder. USgeocoder is a wholly-owned product of USgeocoder LLC, a woman owned and operated company based in San Jose, California. USgeocoder LLC specializes in GIS data processing and mapping, advocacy management, custom web programming, political campaign and business management, and sales tax compliance. USgeocoder also provides core location technology for lending management and federal compliance to banks across the USA. USgeocoder LLC started development of USgeocoder in 2008 with a team of GIS scientists, mapping experts and experienced political advocates. Our lead Cartographer is a nationwide authority on open source Geocoded databases and open layers mapping technology. In the 2008 election cycle, he designed and developed President Obama's GIS system that analyzed and reported voter trend, preference, history and demographics in key battleground states. Our lead GIS scientist began developing geospatial software solutions in the early 1990's. As the author of a seminal patent in facilities mapping automation for telecoms and utilities, he is considered one of the "fathers of GIS". We would love to help you with your next district or Census demography matching project! Talk to us, please call 1-888-938-6732 or contact us by web form. This image illustrates how district information is produced. The pin is the address and each layer of maps the pin can pierce identifies classes of information available for the address. We can add as many layers and as much information per layer as you want to the base map. You have data you want on your maps? We can incrorate that data into maps for any addresses in the US! The information we can reveal is limited only by your curiosity! To see USgeocoder in action, try our interactive demo. To find out how we can help you with your district matching needs, please call 1-888-938-6732 or fill out and send us this simple web form.